Team Up and Come Down! A 4-day visit to Guatemala to see and experience first-hand the broad scope of the ministry. 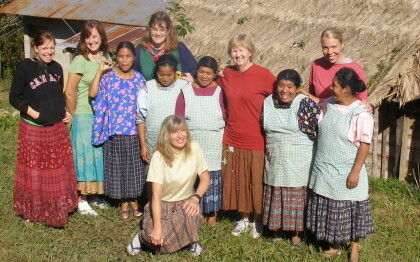 Meet the Pokomchí Ministry team, travel to mountain villages and meet the people who benefit from our programs. For more information or to plan a Vision Trip, please contact us. A 10-day trip to Guatemala with a group of up to 15 people. The team lives right in a Pokomchí mountain village, working and playing with the people of the village. Activities: Help village families build their latrine or rain-water collection tank, Bible-based fun activities with children, participate in Pokomchí activities of daily living through a cultural half day, pray for needy and play with the kids. Great works, great fellowship, great food! Teams Info Packet – For more information, or send/join a mission team please contact us.